I’m starting a new job. My new boss is from an East European country, and has accented characters in her name (ž to be exact). I would like to be able to use the correct diacritics when writing her name. Easy on my Mac (long key press to show all diacritics for a letter), but less so on my Android phone. While the android language setting is set to English (UK) this character isn’t available via a long press (as it would be for è, â and ç). To make it available, I need to add a language that includes it (Croatian for example). Enable your home language and the additional language that has the characters you need. Now the accented options are available on a long press of the parent letter. I also noticed that the gboard suggestions now includes the accented characters when before it didn’t. After reading an excellent article about Bitcoin in the London Review of Books, I have become interested in cryptocurrencies. In order to learn more I decided I needed to get some practical experience, so I bought some Bitcoin. Here are my experiences and observations, which I hope will save you some time and energy if you are looking to buy a small amount of Bitcoin from the UK. If you want to get your feet wet with Bitcoin from the UK, use Circle to buy up to £200 a week worth of Bitcoin. Buying Bitcoin proved to be quite complicated, partially due to banking requirements known as AML/KYC (Anti Money Laundering/Know Your Customer) which means setting up an account with a bitcoin exchange can be quite arduous. They all require proving your identity, and different exchanges take this to different levels. This can mean you will have to wait up to a week before you can buy any bitcoin. Even more frustrating is other costs and delays aren’t always apparent until after you have completed the registration process. You can waste an awful lot of time going through a registration process only to find the exchange isn’t worth using in your circumstances. When buying a small amount of Bitcoin, you don’t want to lose much in fees when you buy them. This can occur in a couple of places. The exchanges may charge transaction fees – usually a small percentage of the transaction value. In many cases this may not be a problem, since those Exchanges may offer a better exchange rate – depending on your volume this difference may more than make up for a fee. Do your maths! A bigger obstacle is that a number of exchanges no longer operate UK based bank accounts and don’t accept debit cards in GBP. This means using international bank transfers. Even within Europe this is going to mean your bank charges you for SWIFT or SEPA transfers – Nationwide charge £20 for this. So buying £100 of Bitcoin this way is going to cost you £120. If you are buying a small amount of bitcoin avoid exhanges that don’t accept credit cards. The website bittybot.co gives relatively up to date rates for most exchanges and marketplaces, as well as other information including which places accept UK bank transfers or credit cards. The following table summarises my experience with different exchanges. Coinbase Horrible – they use a video system based in Germany where you video chat with someone who may not speak English who tries to take a clear photo of your passport via a webcam – this failed every time for me, till I gave up. Their Android app can be used to take a photo of your drivers license, which is better, but you need to disable any screen dimming apps like Twilight for the app to work. However, after going through this it turned out they don’t allow bitcoin purchase from the UK – frustrating! 3% fee for credit or debit card, but unclear if you can use UK debit or credit cards. Their app says you can’t. I ended up using Circle for buying my bitcoin. The registration process was simple and quick, they accept account top-up via UK debit card with no fees from them or my bank up to a limit of £200 per week. I’m sure there are reasons to use any of the other exchanges listed above – but for experimenting with small amounts of Bitcoin Circle is the one I would recommend. At some point I may do the maths and figure out what is the most cost effective way to buy Bitcoin for different spending levels. We took the decisions to make all devices in our country offices other than the internet gateway automatically get their IP settings via DHCP, including servers, printers and wireless access points. This goes against the grain for a lot of people, where static IP addresses are the rule for anything other than client PCs, but I think we managed to get a few benefits from doing this, which I shall outline in this post. What was the main driver for going for this change? Deploying printers – we’d often find that local contractors would just assign a local IP address to new printers that they connected to the network, sometimes conflicting with other devices on our network, and often failing to leave any record of the address they had used, meaning we could deploy equipment with addresses that conflicted. Those basic problems created more work than we wanted to be spending troubleshooting such things, so I wanted to find a way to bring it under control. What really enabled this for us was updating our core network infrastructure in all offices with Meraki Security appliances. These had more DHCP features than the previous Cisco ASA 5505. The main thing that was missing from DHCP on the ASA 5505 was being able to assign fixed IP addresses by MAC address. 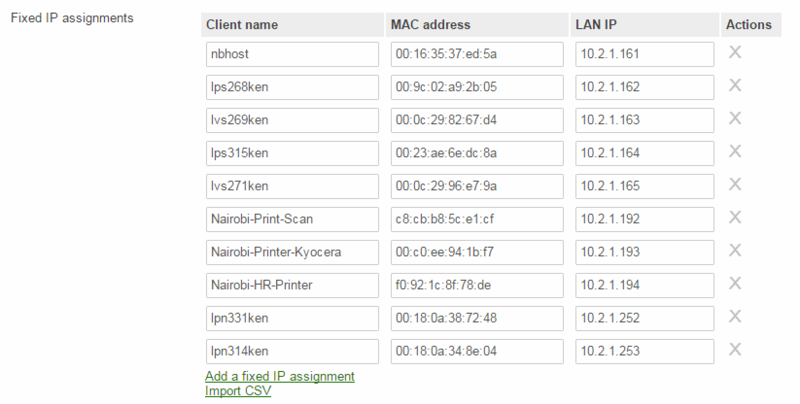 This has made it easy to take control of IP address assignment in our remote offices. Some people don’t really care about which IP addresses are used for what, but since we occasionally want to share printers with other organisations, but don’t want their devices accessing everything on our subnet (or VPN) having a well thought out subnet helps write access rules. If you put all your printers in a part of your subnet that can be defined by CIDR notation, then you can write a routing rule that allows access to and from this portion of your subnet very easily. All our country office subnets are /24. We subdivide those into a bunch of smaller /27 groups that can be addresses using CIDR. These aren’t strictly speaking subnets – you can use the first and last address – but they can be used in routing tables the same way. 10.0.0.224/27 – Network devices – addresses 10.0.0.224 – 10.0.0.254 (the last address can’t be used as it is the broadcast address for the 10.0.0.0/24 subnet. So by assigning printers with addresses between 10.0.0.192 and 223 it is possible to write an access rule allowing traffic only to and from printers to devices in a connected subnet using 10.0.0.192/27. Anything addresses haven’t specified (10.0.0.32 – 10.0.0.159 here) is available for allocation to any client added to the network. That is always up to date, compared to the spreadsheets we maintained before (or didn’t – they were often out of date). Most devices are shipped configured to get their IP settings via DHCP, so it is easy to deploy new devices in remote locations – local staff don’t need to do much more than plug the device into the network. If we want to change an IP address (or assign the same IP address to replacement hardware) we can just connect the device to the network, change the DHCP settings, then power cycle the device to pick up the settings. That is very easy to communicate to local staff than walking them through configuring IP settings on a printer. Everything is configured to use DHCP (apart from the DHCP server itself of course) and life is a little bit simpler. If you need to enable “naked” internal hostname resolution for clients, don’t forget to set DHCP option 15 to add your domain suffix – e.g. example.local. If you have multiple internal domains that need to be resolved you can also use option 119 to list a comma delimited list for clients to search through.